Serialized in The Country Gentleman, April 8, 1916 ff. My favorite animal on the earth is not humans but horses. Especially the wild ones. I wouldn’t like a stallion attacking me, but its beauty and grace of movement is undeniable. 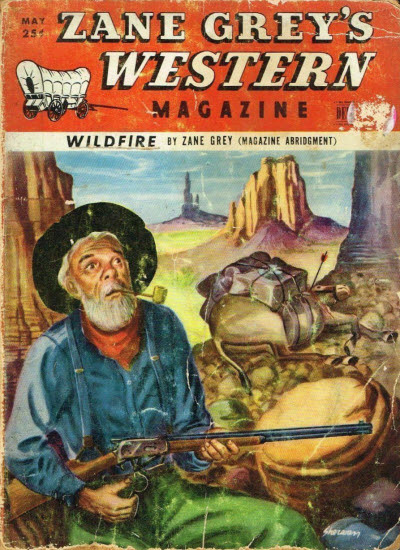 In this Zane Grey novel we get to meet the Mustang Wildfire. Lin Slone, one of our main characters, is a horse wrangler. In the 1870’s a horse wrangler was the person that managed the spare horses on cattle drives. The wrangler kept the horses happy and was also the one who knew how to train a newly caught horse (unless he was fresh to the game). Lin Slone is an experienced wrangler who prefers the company of horses and the solitude of nature to the company of people. He is, of course, going to be the man who ends up capturing Wildfire but that capture costs both man and horse a great deal. Slone was packed and saddled and on his way before the sun reddened the canyon wall. He walked the horses. From time to time he saw signs of Wildfire’s consistent progress. The canyon narrowed and the walls grew lower and the grass increased. There was a decided ascent all the time. Slone could find no evidence that the canyon had ever been traveled by hunters or Indians. The day was pleasant and warm and still. Every once in a while a little breath of wind would bring a fragrance of cedar and pinyon, and a sweet hint of pine and sage. At every turn he looked ahead, expecting to see the green of pine and the gray of sage. Toward the middle of the afternoon, coming to a place where Wildfire had taken to a trot, he put Nagger to that gait, and by sundown had worked up to where the canyon was only a shallow ravine. And finally it turned once more, to lose itself in a level where straggling pines stood high above the cedars, and great, dark-green silver spruces stood above the pines. And here were patches of sage, fresh and pungent, and long reaches of bleached grass. It was the edge of a forest. Wildfire’s trail went on. Slone came at length to a group of pines, and here he found the remains of a camp-fire, and some flint arrow-heads. Indians had been in there, probably having come from the opposite direction to Slone’s. This encouraged him, for where Indians could hunt so could he. Soon he was entering a forest where cedars and pinyons and pines began to grow thickly. Presently he came upon a faintly defined trail, just a dim, dark line even to an experienced eye. But it was a trail, and Wildfire had taken it. Slone halted for the night. The air was cold. And the dampness of it gave him an idea there were snow-banks somewhere not far distant. The dew was already heavy on the grass. He hobbled the horses and put a bell on Nagger. A bell might frighten lions that had never heard one. Then he built a fire and cooked his meal. It had been long since he had camped high up among the pines. The sough of the wind pleased him, like music. There had begun to be prospects of pleasant experience along with the toil of chasing Wildfire. He was entering new and strange and beautiful country. How far might the chase take him? He did not care. He was not sleepy, but even if he had been it developed that he must wait till the coyotes ceased their barking round his camp-fire. They came so close that he saw their gray shadows in the gloom. But presently they wearied of yelping at him and went away. After that the silence, broken only by the wind as it roared and lulled, seemed beautiful to Slone. He lost completely that sense of vague regret which had remained with him, and he forgot the Stewarts. And suddenly he felt absolutely free, alone, with nothing behind to remember, with wild, thrilling, nameless life before him. Just then the long mourn of a timber wolf wailed in with the wind. Seldom had he heard the cry of one of those night wanderers. There was nothing like it—no sound like it to fix in the lone camper’s heart the great solitude and the wild. Lucy Bostil is our female main character. She has just turned 18 (Zane Grey generally liked them young, both in real life and in his novels) and is excited about finally being considered an adult. Her father is horse crazy. Bostil owns quite a few horses but is always on the look-out for that “one, perfect” wild stallion. I guess you could say that he is one of the bad guys because he is willing to go to any lengths to get one. All of Grey’s story try to impart the “Code of the West” on to his reader. One of those codes is “If it’s not your, don’t take it”. Losing his best friend is worth it just so he might retain the status of having the best mustangs. In my mind I see Bostil as any other addict. He is so caught in the grip of his addiction that he will sacrifice family, friends and reputation to get the drug of his choice. Addiction is very much a mental disease and one from which recovery is extremely difficult. Once he has taken care of the competition, Bostil is the one in the county with the finest horse, Sage King. Now others covet what he has. Cordt, the horse thief, wants Bostil’s stallion and he will also do anything to achieve his goal. Because I happen to be on the side of horses rather than that of people, I am going to say that all the men of this story were greedy bastards who took what they wanted no matter the price the object of their desires had to pay. Finnish: Tuliharja; Engström, Don; Helsinki: Taikajousi, 1980. Hungarian: Futótűz; Lendvai, István; Budapest: Nyiry Z., 1995. Portugese: Fogo selvagem; Passos, Maria Margarida & Sousa, Homem de; Lisboa, Agencia Portuguese de Revistas, 1957. Slovenian: Wildfire; Klinar, Stanko; Ljubljana, Državna založba Slovenije, 1962.